Next month, Suzuki will officially launch the fourth generation Jimny off-roader. The launch will first take place in Japan followed by other countries around the world. India is also expected to be a market for the Jimny, but in long wheelbase form. For now, Suzuki has only revealed the short wheelbase version of the Jimny. Meanwhile, a soft-top convertible variant of the new Jimny is also likely in the future. This is in keeping with Suzuki’s approach of offering both hard-top and soft-top options on successive generations of the Jimny. Here’s what it’ll look like. As the render indicates, the Jimny convertible looks butch yet very compact, and will make a great vehicle to be driven around top-down. It’s expected to get the larger, 1.5 litre-4 cylinder, naturally aspirated petrol engine from the off-road focused Jimny Sierra variant. The larger engine is likely to be the K-Series unit with 106 PS of peak power and about 138 Nm of peak torque. A 5-speed manual gearbox will be offered as standard on this engine, with a 4-speed torque converter automatic gearbox offered as an option. Like all other versions of the Jimny, the soft-top version will get a four-wheel drive layout as standard, with both low and high ranges. The vehicle will be based on a ladder frame chassis, with a brand new multi-link suspension on all four wheels. It will have impressive ground clearance and off-road manners. The Jimny will be a four seater. Modern bits on the off-roader include twin airbags, ABS and crumple zones. It’ll also get a touchscreen infotainment system with Android Auto and Apple CarPlay. The soft-top Jimny will only be offered in short wheelbase trim. 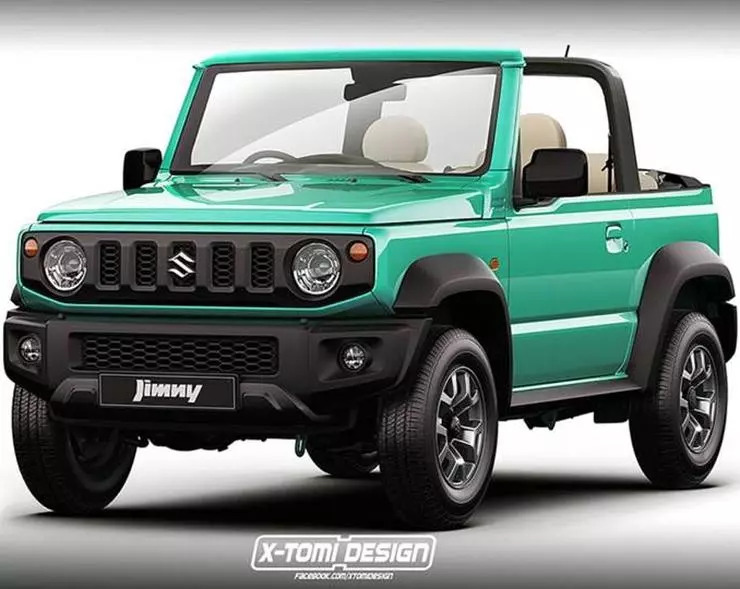 This also means that the chance of India getting the Jimny with a soft-top option is bleak considering the fact that Maruti feels that only the 7-seat version of the off-roader has a decent chance of success in India. So, buyers will have to make do with a hardtop. Many won’t complain considering the dusty weather conditions in most parts of India. If brought to India, expect the Jimny to replace the Gypsy, but priced at least a couple of lakhs higher considering the amount of technology the new off-roader packs in.